OK, I like American pizza once in a while – but Italian pizza is a very different thing. The establishments which specialize in pizzas are called “pizzeria” and often they have menus listing 20 or more types. In Italy, pizza is always made to order (with somebody in the kitchen kneading the dough for the individual pizzas), usually cooked in a wood oven, and has a very thin crust – not oily at all. No where in Italy is pizza an industrial product, frozen and then popped into an oven or microwave to be heated up for the unsuspecting consumer. Typical basic toppings are: tomato, mozzarella and anchovies (Napoli style); Tomato, Basil and mozzarella (Margherita); with mushrooms (funghi) or rugola and cherry tomato (pomodori pachini). Although this might sound similar to American pizza the taste is very different – you will not believe it until you have tried it. Another MUST TRY in a pizzeria is the BRUSCHETTA. It consists of a fingerthick slice of bread, usually toasted in the wood oven, rubbed with a clove of garlic and then sprinkled with good quality olive oil and salt. You may also have it with chopped tomatoes and basil on top. In the oil producing areas, the quality of the new crop is often tested by putting some on a piece of toasted bread to taste. Also the SUPPLI’ is a great snack. It is rice mixed with tomato sauce and mozzarella, formed into a ball then dipped in flour and eggs and deep fried. OK, since it is fried it is not too healthy – but it is worth a try once or twice. What here in the US is called Italian dressing is unknown in Italy and no Italian would use it. Authentic Italian dressing consists of Olive Oil and Vinegar (Balsamic vinegar is also ok), salt and maybe pepper – that is it. (I personally like a mixture of quality Olive oil, Balsamic Vinegar for the sweetness and some fresh lemon juice for the sour with sea salt). No garlic powder in the real Italian dressing. It is not an already prepared, bottled industrial product but rather it is mixed from the above ingredients at the table. In Italian restaurants when you order a salad, you will normally be expected to do the dressing yourself and will be provided with the oil and vinegar set. In an oil producing area, the hosts will not be surprised if you ask for some oil to sprinkle on the bread while you are waiting for the meal to be served. Cesar salad is not known in Italy and it is only available at some very touristic restaurant. I really like the way Italians cook vegetables, either just boiled and then dressed with good olive oil and vinegar, or in the case of some leafy vegetables “ripassati in padella”, that is “re-cooked” in a bit of oil, garlic and possibly red pepper. Artichokes (carciofi alla Romana or carciofi alla giudia are the most famous and better tasting versions) of any kind are delicious, and cooked in many different ways during the main harvest season which is in late Spring. They are used for pasta dishes, as appetizers when steamed with oil and parsley, as side orders to accompany various meat dishes, even deep fried and “crunchy”. In the Veneto area, just the artichoke bottoms are consumed, boiled and dressed with oil, salt, pepper and parsley. Very tiny young artichokes not more than 2 inches high are also prepared in this way. This is a speciality and comparatively expensive. Also in northern Italy, there is an area which produces “white asparagus” that mature under cover so they do not take on any coloring. They are available only for a short period in the late Spring and are cooked in a variety of ways. 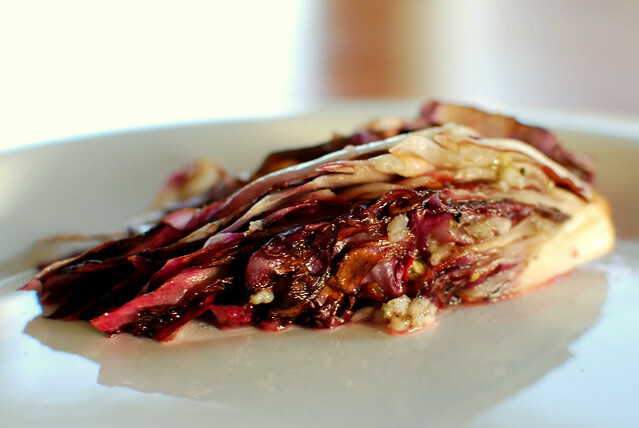 Radicchio and arugola are very popular type of salads many time you can have arugola served on top of pizza and radicchio grigliato (grilled radicchio). Panna is out! Sauces made with heavy cream or similar are out! They are heavy, fattening and they have been de facto ‘banned’ from good quality restaurants in Italy for some time (with only a few exceptions). Personally, I find them on the heavy side and since you can actually add panna or cream cheese or sour cream to anything and it will taste good, I consider this technique as low level cooking. Alfredo Sauce so popular in the US is not served in Italy except in some very tourist-oriented restaurant. What I like: Spaghetti alle vongole (with clams), any type of fresh pasta like vermicelli or strozzapreti with fish sauce or a mix (clams and rugola or salmon and asparagus); spaghetti alla carbonara (with eggs, parmesan, pepper); and bucatini alla matriciana (a long noodle with tomato sauce, smoked bacon, onions and a dash of cognac). There are of course many regional or local specialities and one only needs to be adventuresome to have some amazing taste experiences. There are many types of fish which are consumed in Italy, ranging from whole fish to filets. In the market place the main days for buying fish are Tuesday and Friday when there is an enormous selection. In restaurants specializing in fish, the waiters will advise regarding what is on the menu for the day. Often one can have an “antipasto” or “starter” of mixed fish which is normally steamed or, more recently, raw (carpaccio di pesce spada etc.). After a pasta with fish ( tasting pasta alle vongole is must ), some of the standard dishes include a “misto alla griglia” or mixed fish grill, “pesce al forno con patate” or oven cooked fish with potatoes, and “fritto misto” or mixed fried fish. Again the fried is not very healthy, but it is so good: Grilled fish with cicoria ripassata in padella is one of my favorite combinations. With the exception of certain regions like Tuscany, Italians are not terribly fond of meat. Therefore, meat dishes tend to be more elaborate in their preparation, with less consumption of plain steak. Again, meat dishes vary according to region. 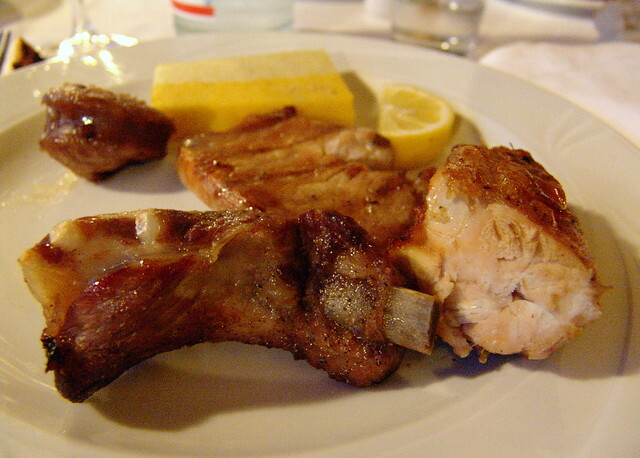 For example in the Rome area, one of the specialities is the “abbacchio al forno con patate” or roast lamb with potatoes, and “abbacchio scotaditto”, literally meaning burnt fingers lamb from the fact that the rather thin lamb chops are grilled and if you pitch in by hand rather than with fork and knife you could get burned. In Tuscany where meat reigns supreme, a grilled “fiorentina”, a huge thick T-bone to be shared by 2 or 3 persons, is a memorable experience. Other highlights are the “grigliata mista” or mixed grilled meats including steak, spare ribs, sausage, pigeon and chicken. Also the “tagliata” is a cut of grilled beef which is sliced and mixed with rugola. Pastry at the end of a traditional Italian meal is generally a bit of “overkill”, and even the Italians are tending to pass up on these in favor of less damaging closings, such as ice cream, sherbet, or local and “exotic” fruits such as pineapple (which is said to help digestion). At most, an Italian with a sweet tooth will have a slice of home made fruit tart, which satisfies the instinct without mortifying the conscience. The wonderful creamy pastries, such as the “millefoglie” or a thousand leaves, the “mimosa” named after the flower that it resembles, the “mont blanc” a lascivious combination of chestnut and cream can only be consumed after a light meal or when the winter temperatures go down below freezing. However, creamy pastries continue to be served at wedding receptions, as part of the traditional conspicuous consumption. If you have the good fortune to be invited to an Italian wedding, wear loosely fitting clothes and don’t fill up on the appetizers and first dishes if you want to survive the remaining sixteen courses. If you want a coffee, an orange juice or a breakfast roll, you should go to a “bar” if breakfast is not served in your hotel. Do not be scandalized and have visions of heavy velvet curtains, myriads of liquor bottles, and dim lights. Italian bars are bright family affairs, where practically no alcoholic beverages are served except for aperitifs around lunch or dinner time. Most of the rest of the time, the bars cater the increasing number of Italians who no longer have time to go home for a leisurely lunch and therefore grab a fast sandwich standing at the counter or seated at a sidewalk table. What the Italians call “caffè” is actually an espresso, and there are many variations on the theme: “ristretto” or concentrated so that a spoon practically stands up straight in the cup; “regolare” or “normale” as it sounds a normal espresso; “lungo” with more water, but still in the small cup; “macchiato” with a drop of milk in it; “al vetro” in a small glass rather than in a cup and so on. A “caffè Americano” is a very diluted espresso in a cappuccino cup, sometimes referred to disparagingly as “brodino” or little soup. The cappuccino is more or less the same as in the US, but you can ask for it “scuro” or dark with less milk, “chiaro” light with less coffee, and “senza schiuma” or without the froth. Any bar offers cappuccino for 1 Euro to 1.40 Euro – it is a smaller size then the US counterpart. It is also offered at an actually drinkable temperature: I never understood why in the US they serve cappuccino at melting lava temperature. I do actually like many ice creams sold in the US. However, if you are in Rome a visit and a taste of fresh ice cream at Giolitti is a must. Italy is rich in tasty products and its cooking is among the best known in the world. A traditional meal represents an arduous experience, and Italians are increasingly being selective in their choices. No one will be surprised if you opt for an appetizer and a first or second course, and skip the cheese and sweets. Some eyebrows will be raised, however, if you choose to drink soda with your meal. If you wish to avoid wine, even in reasonable amounts, then a good fall-back position is to order a mineral water which is surprisingly pleasant and is in fact supposed to be the most appropriate beverage for pasta dishes. In any case, however, for the sake of the chronicle, a traditional meal consists of an appetizer (antipasto); a “primo” (first course) of rice or pasta in its numerous forms, plain or combined with various sauces and trimmings; a secondo (meat or fish course) accompanied by contorno (vegetable or green salad). After the cheese (formaggio), fruit (frutta) is served as well as a choice of numerous other desserts: cakes, pastries and sweets (dolci), ices (gelati) or frozen cakes (semi-freddo). A young wine is usually served in 1/4 (quarto), half (mezzo) or one liter (litro) carafes (sfuso). Ask for a wine list if you prefer better quality bottled wines. There is a wide choice of mineral waters available. I prefer the lightly bubbly (leggermente frizzante). Traditionally the meal ends with a strong, black espresso coffee. The frothy cappuccino dusted with cocoa is also delectable.